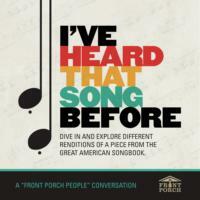 The Front Porch People | "Luck Be a Lady"
Bonus Track: “Fugue for Tinhorns"
Show Notes: Joe and his guest, Carl Topilow, listen with you to 4 renditions of "Luck Be a Lady," exploring the varied paces in the performances of this standard. They dive into the rich history of this song, which made its debut in the 1950 musical, Guys and Dolls. Enjoy a special rendition of this song performed by its composer Frank Loesser. At the end of the episode you can enjoy this week's bonus tune, “Fugue for Tinhorns," performed by the cast of Guys and Dolls.